Purchasing a new piece of art can be very exciting. That excitement soon does turn to stress when you start to think about how the heck you’re going to get it on the wall. How high should you mount it? Can, and should you arrange it with other art? Moreover, how can you hang it in such a way that it won’t fall off the wall? You actually don’t always need to reach for a stud finder or drywall anchors, despite popular belief. Here are some safe ways to hang your art on the wall. •Use picture-hanging hooks, rather than heavy nails or screws. Although they may seem dainty, they are very secure. It’s all based on shear weight. The picture hooks go into the wall on an angle. •Buy the right type of hook for your artwork’s weight. There are basically three types. A 1 nail picture hook holds things that are 30+ lb. A 2 nail picture hook holds pieces that are about 50 pounds, while a 3 nail picture hook holds pieces that are about 75 to 100 pounds. •Use two picture hooks per artwork. Not only does this provide added security but it helps art remain level over time, compared to items hung from a single point. •When possible, install two D-rings, rather than a wire, on the backs of frames, to hang from the picture hooks. Then it’s stationary, and not swinging on a wire, so there’s no pendulum effect involved. •Use a level and ruler to ensure that both the picture hooks and D-rings are aligned when installed. •Recruit a helper who can hold pieces against the wall before you begin hammering in the picture hooks. Then you can take a step back to see what the space is going to look like with the piece there. You get a sense of the proportions and colors, and see it against all the other design elements. 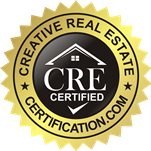 •When hanging a single piece on a wall, the center of the picture should be about 60 inches off the ground, which places it at eye level. •When hanging a pair of works, one above the other, treat them as one large picture (whether they’re the same or different sizes). Find the center point between them, and use the same 60-inch rule. 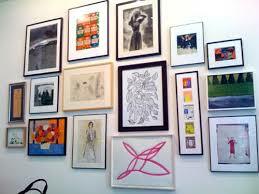 •For spacing between art on the same wall, you should generally use about two inches between larger pictures. If they’re all smaller family photos, we might use an inch and a half between them. That goes for the spacing above, below, and on either side of each frame. •When arranging multiple pieces, don’t just think in terms of a grid. 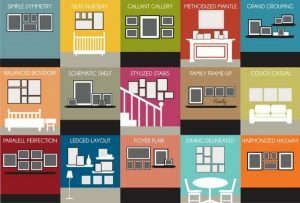 What’s really becoming popular are salon installations; a group of often disparate images or frames clustered together. These types of layouts will usually stretch from one end of the wall to the other, and floor to ceiling. There is no right or wrong way to arrange art this way. Just start in the middle and work your way out. The goal is to make sure that no matter which way you decide to hang the art, that it look proportional. The most important tip is to have fun when hanging art, and not to worry too much about getting things perfect. You’re not doing anything structural to your walls, and your house isn’t going to fall down if you don’t hang the pictures right. If you hang something up and want to move it, it’s really easy to fix the problem with a little spackle. I love to move my art around frequently. The only annoying thing about that is having to patch the walls all the time, but it is really easy. The longest part of it is just waiting for the spackle and paint to dry. Moving art is such a great way to update your home without spending money, when you get the itch for wanting to re-decorate. Totally agree. Except I don’t really do this with my art, I like to move my furniture around. I’ll grab pieces from different rooms, or rearrange what I already have in specific rooms. I’ll borrow pillows from one bedroom and put them in the living room. You really don’t have to spend money to freshen up your rooms.